So how did the second half of the Moving Parts Newcastle Puppetry Festival go? It’s been a rollercoaster ride, that’s for sure. I’m the Writer in Residence for the festival, and you can catch up on the first half of the action here. Wednesday evening saw three events, the first at Alphabetti Theatre. The first, A Song of Plague, blended live medieval music and song-stories with hand puppetry amidst rustic staging. Simplistic storytelling took a surprisingly meaningful twist when it transformed into a parable about respecting nature. Very relevant today and definitely struck a chord with me. After a quick drink at the bar, I ambled across the road to Dance City for the UK premiere of Noone’s Land. My favourite performance so far, the story centred on the sights and sounds experienced by a scarecrow alone in a field. Lighting, sound and visual effects shaped a dreamlike atmosphere, and left me deeply moved. I’d been convinced that there must be at least four performers and couldn’t believe my eyes when there turned out to be only two. A quick walk back to Alphabetti for a showing of Anomalisa, a darkly comic and surreal stop motion journey into a Kafkaesque nightmare to finish off the night. The show was followed by an hour of stop motion animation films, including the premiere of the Moving Parts Stop Motion Animation Commission, written by myself and animated by Chloe Rodham. The series of short films had variety to have the audience laughing, sighing, hiding behind their hands, and then staring wistfully at the blank screen afterwards. After a short break at the bar, the crowd were shocked, uplifted, bemused, and sometimes heckled by an hour of spontaneous Puppetry Open Mic. Friday turned out to be ‘horror’ night, and it began with Stephen Mottram’s multi-award-winning The Seed Carriers. An hour long, this blend of Hannibal and The Dark Crystal made the most of disturbing music and sound effects which trickled across the stage and synchronised with the oft-masochistic treatment of human-esque beings trapped in a brutal social system. Very, very, dark, and very, very, well done. We plodded across the road to Alphabetti for the next performance and met with a giant street puppet and street sing-a-long of Dream A Little Dream of Me. A beautiful moment. Next up, Seaside Terror, a string of short horror stories staged inside an ice cream van and hosted by a deranged ice cream man. Some disturbing, some spooky, some sad (particularly in the case of seaside singer Sharon), and all surprising. I didn’t want this odd mix of horror and hilarity to end. And then the last night of the festival, and I’ve never been in a theatre where the audience has laughed so loud and for so long. In Coulrophobia, our protagonist clowns, Dik and Adam, try fruitlessly to escape from their cardboard prison, bringing unwitting audience members onstage for the ride. Brilliant. And the only thing left to do was party the night away in Alphabetti to the galactic notes of Henge and Offworld Dreamers. Obviously. Part celebration and part performance in itself – it felt like the perfect Blowout to end another sell-out festival. What a week! 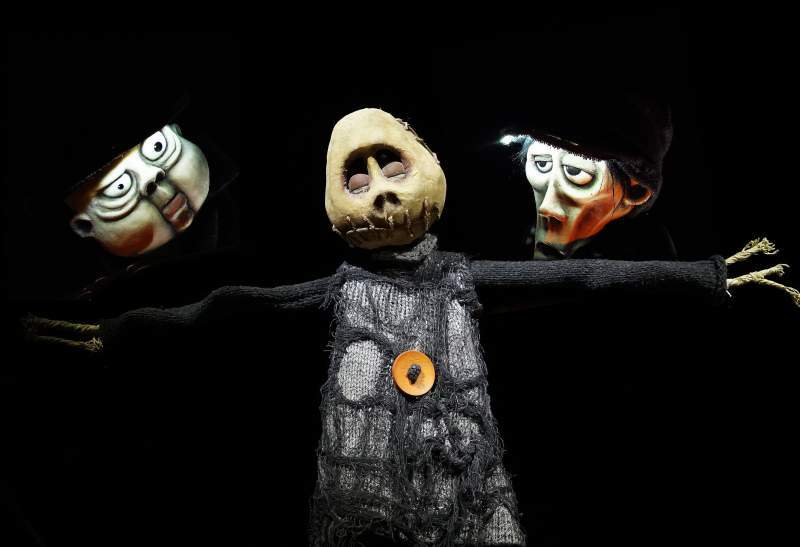 Every single performance has been different – from string puppets to masque to a lump of bread dough – seeing all the performances in quick succession demonstrates the breadth of what’s possibly in modern puppetry. But – the theme they all share is the desire to transcend what confines us. Strings, situations, stages. Whether it’s a scarecrow wishing to break free of his field or a lump of dough desperate to be true to herself and escape the oven – we all dream of breaking free of our tethers. And this is why puppetry is so poignant. It allows us to pour our imaginations into beings that are physically and metaphorically tethered, and thus lose ourselves in their stories. Until the next Moving Parts, I’m going to get practicing my puppetry skills.